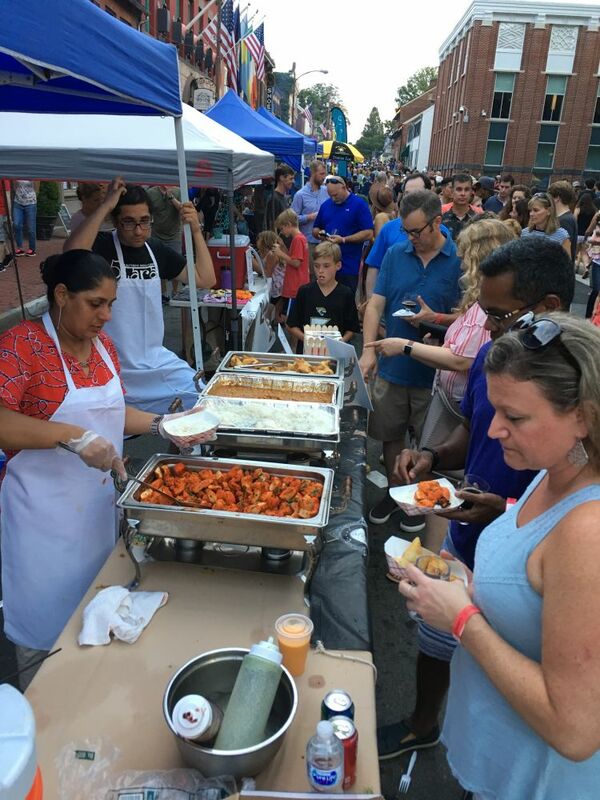 A massive crowd of hungry—and thirsty—patrons poured into downtown Leesburg for the inaugural Taste of Leesburg on Saturday. The event was seen as an experiment for the town’s Parks and Recreation Department, which puts on the successful Flower and Garden Festival each April. But it was a hit. So much so that the downtown streets at the night’s high point were filled sidewalk-to-sidewalk with visitors. Brewers said they ran out of beer within the first two hours and had to hurry back to their breweries to get more kegs. Several vendors sold out of food and servers at a few downtown restaurants said they ran out of some of their key ingredients, even ice. Lines that stretched 40 or more people long led to a ticket booth where people could purchase tickets for alcoholic beverages. 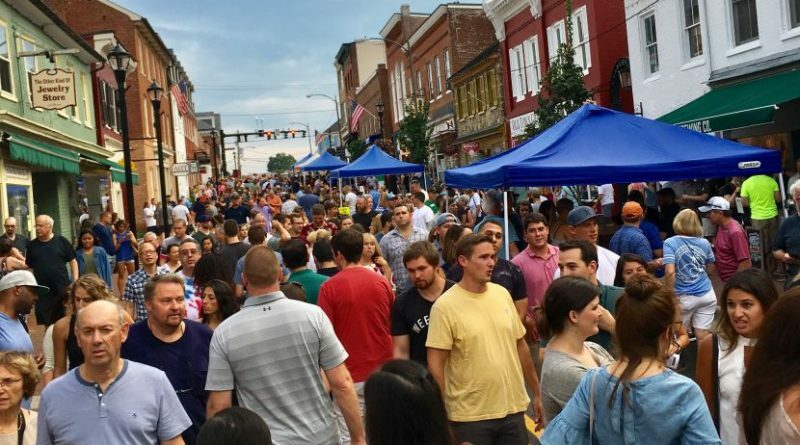 Then more lines led to the tents serving beer from local breweries, wine from local wineries, and food from nearby restaurants, including several from around Leesburg that do not have storefronts downtown. Most downtown restaurants also reported a surge in sales. Parks and Recreation Department staffers were bubbling with pride Monday morning as they shared that early estimates gauge attendance at about 5,000. That was on the high end of their expectations. The good turnout could be attributed to the great weather, which wasn’t too hot and delivered only a few minutes of rain. As with any event, there were some lessons learned and takeaways, and staff has already begun evaluating any possible tweaks to next year’s event. Smith said it was too early to say if the event would be moved to a different time of day or year, but said the August evening event fit well within the department’s already robust schedule of annual events. “Starting earlier [in the day] could be an option but we liked the ambiance of the evening,” said Events and Community Outreach Manager Linda Fountain. Part of King and Market streets were closed to traffic during the 5-10 p.m. event, providing space for booths, live music, a live comedy show, kids’ activities and several thousand people. This event needs to be revamped next year. Long lines, vendors running out of tasting beverages, food trucks not prepared for these crowds. We cut out after buying drink tickets and enjoyed the lovely Oyster Bar! Tickets should be sold online next year and Hands stamped at the gate. Great event for Leesburg! Just needs some process improvements. Trucks as in plural? We only saw one actual food truck and were super disappointed. Ended up going to Bites – they were hustling but seemed completely overwhelmed by the crowds. Looks like no one took the time to reach out to local restaurants either. This event has promise – hopefully next year they can plan a little better (and have more vendors that are actually from Leesburg). Our group of eight decided to skip the long lines and had dinner at our favorite downtown spot, Trungo’s (formerly Leesburg Brewing Company). By the time we left, Trungo’s was at capacity.